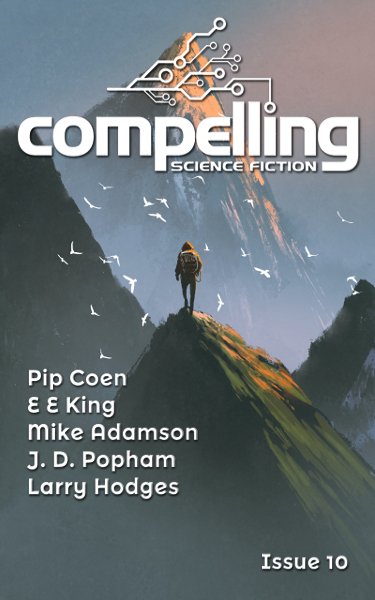 Compelling‘s second issue from its current semi-annual schedule brings us five more science fiction short stories, most of which deal with varieties of economics and/or forms of biotech and most of which have some interest, including one recommended story. Full review at Tangent: Compelling #12, Winter 2018. On its new schedule as a semi-annual, this is Compelling‘s first issue after a six month break and it was worth the wait. In terms of quantity, with the help of a reprint, it has one more story than its ever had before, though the word count is not appreciably longer but, in terms of quality, I recommend two tales (almost three) and, while not quite on those levels, personally enjoyed a couple more. Full review at Tangent: Compelling #11, Summer 2018. The tenth issue of Compelling (which ends the bi-monthly era and begins the semi-annual one) brings us five tales which include a couple of aliens, a robot, a future corporation, and a variety of religious experience. None are bad, and the last couple are the best. A woman and her crewmates must deal with her discovery that an alien (she says “parasite,” it says “symbiont”) has infiltrated her body and wishes to “share” the “vessel.” The opening first person narration of the paralyzed protagonist is initially confusing. The repeated “I did [something]… except I didn’t” which is meant to express her wish to talk, laugh, scream, whatever, and her inability to do so, gets tiresome. Finally, while the theme appears to be addressed by the end of the story, it feels like the plot is cut off abruptly. All that said, it’s readable and provides some things to think about. This tale of a woman seeing the Virgin in the water stains on her building (and what happens to her city and beyond) initially had me wondering where the SF was but it finally appeared. This long flash/very short story is not especially related to Arthur C. Clarke’s “The Star” and not on par with it, of course, but it made me think of it in a way. Ruinous climate change is pushing corporations out into space while leaving the poor folks behind. A woman who lost her parents to a space mining accident has risen to a high position in one of those corporations when an attack is made on one of their space resources. Dealing with this attack is just the tip of the iceberg. Despite the off-screen space action and the futuristic setting, this story doesn’t focus on its science fictional aspects and, partly because of something the author’s doing with the main character for plot purposes, she isn’t fully engaging, so the story’s basically about corporate shenanigans that have an interlocking puzzle-piece interest but not a lot beyond that. And ultimately, the theme, however worthy, seems kind of simple and labored. It’s not a bad story insofar as there are several points of interest to keep the reader going but it’s just not fully rewarding. After all its siblings have been destroyed as a threat to the human workforce (a second story partly concerned with future economics), an old robot makes its break for freedom against many obstacles. This action-adventure tale may not suit everyone but I liked it a lot. It was very exciting and the multiple stages of the robot’s efforts were very well conceived and described. Mesen, the giant alien caterpillar, has been taking a census of the Earth as it was when he arrived through the magic of his redo device. With certain provisos, it resets the Earth back to how it was. Thus people on Earth have passed over 80,000 years into the galactic future in ten minute increments without ever knowing it. So it happens that he meets a woman who seems to be his best interview until the interview quickly turns into his worst. An alien invasion fleet is just one of the many issues. But with the magic of the redo device and a lot of ingenuity, he and his new human friend can try to save the day. There is a loopy part in the late-middle of the story which isn’t a lot of fun to read and something I can’t put my finger on isn’t entirely satisfactory but this is a heck of an idea which is generally executed well and the story is pretty amusing, not least due to a very charmingly conceived alien. I kept having the feeling that there was an internal logic failure or other flaw and then kept rethinking it and realizing the story had it right, as far as I could tell. So, again, not actual hard SF (or “plausible”) but with a lot of the mental fun of it. Good stuff. Edit (2017-12-01): add semi-annual note, modify markup. Reviewed what is ordinarily a very interesting webzine in which I’ve always found something of special interest (and sometimes several things of great interest) but this issue was unfortunately atypical. In “What’s a Few Years When You Get Money and Friends in High Places?” I couldn’t buy the “Head/Off” premise (a body builder and a rich guy whack their bodies and heads apart and trade pieces) and the ending was pretty trite but, in between, it was well done, interesting, entertaining, and didn’t always do the expected. “Integration” features a constituent of an AI collective loading itself into a robot body to learn how the other half lives and seemed quite fresh though a little too cute and slightly constructed, especially for its heavily theme-centered thrust. “Fathom the Ocean, Deep and Still” gets major points for taking a can-do approach to climate change where we don’t solve the climate change problem but do work around it in an amazing way. As someone who takes climate change extremely seriously, I don’t think this “when life hands you lemons” approach is ideal, obviously, but have to admire its boldness. On the other hand, the plot is extremely predictable, though executed well enough, given that. The one story I didn’t single out as noteworthy was “Cogito Ergo Sum” which takes the very tired approach of using a robot (here questionably called an android because of a flesh surface) to question “what makes us human?” and is one giant “as you know, Bob” with some unconvincing emotions tossed in, but even it is readable. Of the other honorable mentions aside from Compelling‘s, “Bourbon, Sugar, Grace” has thirty-four confusing uses of “moms” and a somewhat implausible premise (likely cost-ineffective, among other things) and deus ex ending but is otherwise interesting and unusual and its milieu of a hardscrabble colony being shafted by the corporation felt tangible and plausible once the premise was granted. “Marcel Proust, Incorporated” is an infodump of unconvincing melodrama but had a fairly fresh idea of brain-stimulated learning and was interesting despite its problems. “Utopia, LOL?” is severely flawed by its choice to project yesterday’s webspeak into the far future but, if you can get past that, this almost Futurama-esque tale of thawing out the cryogenically-preserved primitive is reasonably funny and entertaining and with a serious undertone. Finally, “Owning the Dragon” is a wacky (symbolic) take on a woman and her dragon and juggles a surface (and much more individual) whimsy with its own serious intent. Edit (2017-07-04): Well, Tor.com didn’t publish another story but I did notice I’d missed Diabolical Plots‘ “B” story again, so read it, which brought the totals up to 36 stories of about 171K words. It’s a familiar setup when we see two human diplomats through the cognitive estrangement of alien perception but angels (so to speak) are in the details just as much as the devil. The aliens’ love of constant, arbitrary change is interesting and they are generally nicely judged, not being “bumpy forehead” aliens nor incomprehensibly bizarre for its own sake but merely comprehensibly strange. When things go haywire and the shapeshifting ability of the alien spaceship is damaged, the psychological and mathematical elements of the tale come even more to the fore and they are quite interesting. In a way, this is a very old-school tale—one might wonder why the alien engineers haven’t foreseen this potential problem and developed some kind of “VR” solution or something—but I like the “beings and ships” sort of flesh-and-steel pre-cyberpunk sensibility. And I’m not sure it’s not a flaw for a part of the ending to be dependent on insider information but at least very few SF fans will fail to get it. I enjoyed this one. This story takes place in the near future when VR is quite advanced. William and Tav have been the primary movers behind a company that has gotten phenomenally large and powerful. After a celebration party for William at his home, Tav (the viewpoint character) is invited downstairs by the host of honor where William’s very special VR, and an entity in it, is revealed. The three then tour the realm and have a psychologically and existentially loaded conversation that creates a remarkable degree of tension and even spookiness. It leads Tav to make a radical move. Between the VR and the existential question of “is it live or is it Memorex?” that occupies a good chunk of the story, it’s not the most original thing I’ve ever read but it takes an unusual approach in terms of its viewpoint character. It is also not unusual in being mostly conversational but, as I mention above, it makes that conversation unusually dramatically effective. Also, it doesn’t use its VR basis as an excuse to write a fantasy in SF’s clothing, hewing to merely “enhanced” reality, and provides fairly detailed descriptions of the VR tech and the entity, which were deftly exposed mostly via the subjective experiences of the viewpoint character and only minimally via the conversation. The one serious criticism I might have involves the finale but even though it feels a bit easy, it’s in keeping with both William’s and Tav’s characters and seems plausible in that sense. The story maintained my interest, was sharply delineated and, unlike much other webzine fiction, felt like genuine science fiction, and I definitely enjoyed it.